Chris Townsends new Cicerone guide hit the mat this morning. With a thud. Chris says that this book was six years in the making. I can believe it. Scotland in one book! Not a light undertaking I'm reasured by the fact that it took so long. I would always hope that the authors of such guides have walked the walk. You just know that Chris has. At first glance the book looks ordered, well written and beautifully layed out. Chris's easy but authoratative style, recongisable from his TGO columns and blogs, has thankfully survived the editors hand. The man and his love of the hills shines through. I especially like the fact that this isn't simply a walking guide, attention is also paid to ski touring and mountaineering. 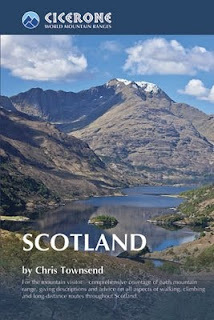 I'm already thinking this is going to be my go-to-book for the region and I'm going to enjoy getting to know it, and in turn perhaps Scotland, much better.